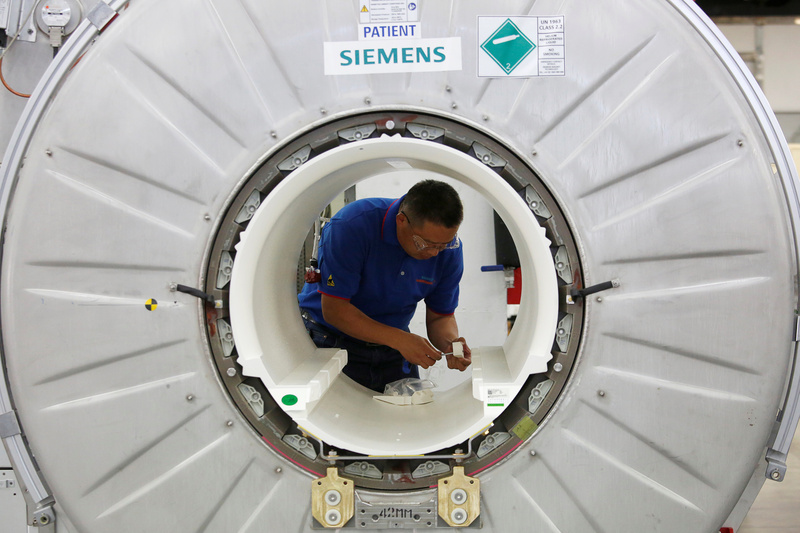 A staffer works on a magnetic resonance imaging machine at a production line of Siemens Healthineers in Shenzhen, China May 25, 2018. Amsterdam-based medical health group Philips on Jan. 29 said its revenue in the final quarter of 2018 was 5.6 billion euros, or 5 percent higher than the year before on a comparable basis. It reported earnings before interest, taxes, amortisation and one-offs of 769 million euros, implying a 13.8 percent EBITA margin compared with 13.6 percent a year earlier. Chief Executive Frans van Houten hiked the dividend by 6 percent to 0.85 euros per share and initiated a share buyback programme worth 1.5 billion euros, or roughly 5 percent of Philips’ market value. Siemens Healthineers, which also reported on Jan. 29, said sales grew 3 percent in comparable terms to 3.3 billion euros. Its earnings before interest, taxes, amortisation and one-offs like severance costs were 532 million euros. Healthineers’ adjusted EBITA margin shrank to 16.5 percent in the quarter from 17.1 percent a year earlier. Philips shares were up 1.6 percent to 32.8 euros at 0845 GMT on Jan. 29. Healthineers’ Frankfurt-listed shares were down 4.8 percent to 33.6 euros.